Yancy Culp is an internationally recognized OCR coach with an all-star cast of Elite Spartan Athletes in his stable. 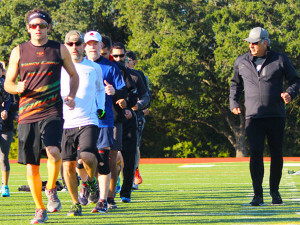 It was great fortune for Coach Richard Diaz, his “Posse”, Miguel Medina, Nickademus Hollon and his wife and long time running mechanic Lori Diaz to converge in Austin Texas to put on their ever popular Off Season Running Clinic. It was a great experience for all in attendance, many who partook in A VO2max test administered by Coach Diaz, running fundamentals and a real time technical trail running clinic directed by Nick Hollon, world renowned Ultra Trail Runner and Elite Pro Spartan Miguel Medina. Post event, Yancy Culp and Richard Diaz discuss the importance of honing running skills in the off season and how running influences the sport of Obstacle Racing. Love the stuff Yancy is doing with Yancy Camp. Always new, never boring and I am getting i the best shape of my life at 37. Can’t wait to see how I do this years NJ Spartan Beast!